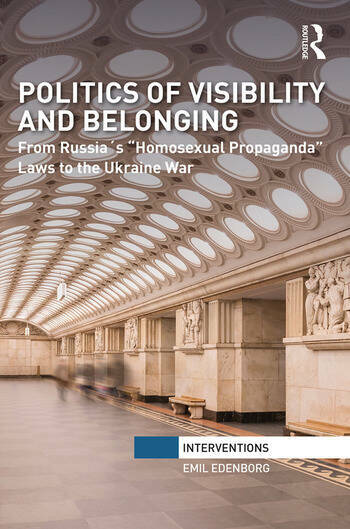 In this book, Edenborg studies contemporary conflicts of community as enacted in Russian media, from the ‘homosexual propaganda’ laws to the Sochi Olympics and the Ukraine war, and explores the role of visibility in the production and contestation of belonging to a political community. The book examines what it is that determines which subjects and narratives become visible and which are occluded in public spheres; how they are seen and made intelligible; and how those processes are involved in the imagination of communities. Investigating the differentiated consequences of visibility, Edenborg discusses what forms of visibility make belonging possible and what forms of visibility may be related to exclusion or violence. The book maps and analyses the practices and mechanisms whereby a state seeks to produce and shape belonging through controlling what becomes visible in public, and how that which becomes visible is seen and understood. In addition, it examines what forms contestation can take and what its effects may be. Advancing theoretical understanding and offering a useful way to analytically conceptualize the role of visibility in the production and contestation of political communities, this work will be of interest to students and scholars of gender and sexuality politics, borders, citizenship, nationalism, migration and ethnic relations. Conclusion: nothing more to see? Emil Edenborg is Postdoctoral Researcher at Södertörn University, Sweden.